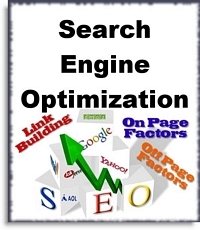 Search Engine Optimization (SEO) consists of several processes that are applied to your web page for the purpose of ranking on the first page of a search engine for your targeted keywords. There are many aspects to search engine optimization; keyword strategy, on-page optimization strategy and off-page optimization strategy. All these strategies applied in unison help to drive your search engine rankings up the organic listing (indicated on the picture below). Keyword strategy focuses on determining the best keyword terms to use and which to work on for top search engine ranking. Further, choosing the right keyword phrase is the key to how a searcher will find your products and services on your site. On-page optimization strategy balances what you need to do on your web page to help the search engine know what your web page is about (via your keywords) and making your web page presentable to a human visitor so they remain on your site and eventually take action (i.e. buy or contact you). Off-page optimization strategy focuses on getting back links to your web page for the purpose of increasing the importance and value of your web page. The ultimate goal to doing SEO is to have your web page rank in the first page of Google™. The first page is where most search engine users click to find what they are looking for. If this is accomplished, the other search engines Yahoo™ and MSN™ will eventually follow. Some sites rank better on Yahoo™ and MSN™ before Google™ and that is a good thing, because eventually Google™ will favor these sites just for that reason. The main advantage of SEO is receiving 100% free targeted traffic from the search engine to your site. The negative side of SEO is that it takes a lot of work and it takes a long time before you can see results. Further, there is no guarantee to get top ranking for your aimed keyword phrase, especially on highly competitive keywords. Applying SEO strategies can not happen overnight. In fact, it can take months, 6 months at the least, before the proper outcome is fully achieved. It is very possible to get a steady source of targeted visitor traffic with the right keyword choices by applying on-page optimization and off-page optimization actively. This is where you eventually want your key web pages to appear on the search engines. If you want to be successful online, you got to learn the RIGHT INFORMATION that will help you achieve that goal. Feed your mind and gain the knowledge about the area you want to succeed in. Take the time to study the right concepts and put it into action and your business will succeed. We Are Here To Help You Get It Right!